The very same vacuum tubes that were common as dirt at $1.50 each 50 years ago (as the industry quickly designed new transistorized amplifiers to get away from the "old fashioned" tube designs) are now scarce, desirable and sought after, and can sell for $150 or more. Nowadays tube amplifiers are also highly regarded, and vintage ones the industry quickly abandoned for the "new" solid state designs are now considered very desirable and sought after. Are you hearing everything on the recording? Audio sonic improvement for the listener is incremental mostly. But it was not in the studio or the live event which most were recorded using a mobile setup. How did the engineers produce a recording that everything that the microphone picked up was is transferred to the medium of choice. I continually hear listeners say “I never heard that before or it sounds better”. I continue to ask....what do studio electricians do that the majority of consumer systems don’t do in there setup. So all the information is captured on the recording no matter if it was recorded in the late 1950’s and beyond. It is such a standard practice maybe most don’t understand it’s significance. I think they do though. Fifty years ago, in my bedroom, I had an RCA contemporary console stereo. It was kinda low, with a long narrow blue speaker grill covering 4 speakers and it had sliding dark(like black) covers. 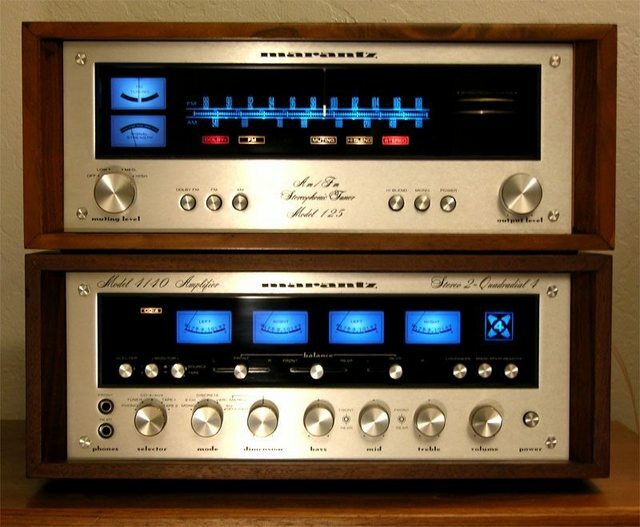 Under the covers, on one side was the AM/FM tuner and turntable, on the other was just a flat veneered surface for accessories, records or whatever. It was sitting on it's chrome stand, which also doubled as a record rack that probably help 100 LP's. As cassette tapes had come into their own, and I had got my first cassette tape recorder, Admiral brand, in the summer of 1967, around fifty years ago, I got my first stereo cassette tape deck, a Panasonic with noise reduction. This plugged into auxiliary RCA inputs on my console. During the 1970's, I started accumulating separate components. Today, I have an entertainment room, including a huge flatscreen TV, a 7.2 home theater system, including several Sony mega-disc changers, an Oppo universal player and an ADC Accutrac +6 programmable turntable. Also, I have another system in that room. It has a Pioneer QX-949 quad receiver at it's heart with a Teak A-2340R r2r quadraphonic tape deck, whatever turntable I am using at the time(with universal head shells with appropriate cartridges mounted and the capability to pass through the 30khz carrier signal on CD-4 records) and a matched set of 4 JBL speakers. Oh, also, 50 years ago, virtually every store had a record/tape department. On Saturdays, I would hop on my bike and make the rounds, probably covering 10 miles. Sometimes, I'd ride the bus to the downtown mall. Must have been more than 6 stores selling records. Atleast one dedicated record store and many big department stores. Even the Singer Sewing Machine store sold records, from the current hit 45's and LP's. Singer would sometimes have exclusive LP's. Today, selling music from a storefront is rare. For new and used, there is Rasputin Music, some independent stores, including antique shops. Very few 'stereo' stores or even stores which sell good new sound equipment are left. Best Buy is one of the few. Very sad. It is nearly impossible to try out before you buy. Oy. The old 'horseshoe' magnetic cartridges date back atleast to the 1920's. The principles are the same, but, yes, phono cartridges of all types have improved and most importantly, the stylii. Improvements to cartridges have been in frequency range, for Hi-fi records and tailored to reproduce a certain sound. A stylus is also specifically designed for that cartridge to create that certain sound quality. Changing to a different brand/type of stylus can hurt that intended sound quality. There has always been dedicated tube fans, nothing new. Sure they did and even before. With most cartridges being crystal or ceramic forever, if you 'upgraded' to a magnetic cartridge, you had to add a phono stage. Most amps or receivers didn't have them. Even going back to the late 1940's, Zenith introduced the Radionics 'Cobra' cartridges. They more like produced a radio frequency which had to be converted to something which an amp could use. If the amp didn't have it built in, what you might call a phono stage had to be added in between. Often, it was a single tube phono stage. Today, we have multiple phono stages to choose from. And, as there is no standard, each phono stage will have a different sound. I continue to ask....what do studio electricians do that the majority of consumer systems don’t do in there setup.. I'm not sure what you're asking about electricians. But one thing studios have that home listeners don't have, is carefully controlled acoustic environments. It has nothing to do with the work of electricians. It's the work of acoustic engineers. But studio control rooms are very damped studio environments with selective use of diffusion to make sure that decay times are close to equal across the audible range and frequency response is flat at the listening position. And this is done not just by ear, but through extensive testing to shoot the room. Most home listeners don't have anything close to an equivalent listening environment -- purpose build rooms with non-parallel walls and extensive absorption and diffusion, etc. -- nor do most to the kind of set up and testing you might do configuring the control room in a pro studio. (Similarly, one thing the best mobile live sound reinforcement systems might do -- where the room acoustic vary from venue to venue -- is DSP and extensive testing to make sure frequency responses and time relationships are flat and linear throughout a venue (or as flat and linear as possible). Of course, there are (and were) plenty of not great sounding studio control rooms, and listening conditions during a tracking session, with a giant mixing console in place, often aren't great. But the room acoustics aren't usually a factor. The room is kind of taken out of the equation with architecture and heavy treatment. Another thing is routine daily maintenance. Sometimes customizing gear or having gear custom built, custom matching speaker drivers or something, customizing mics, etc. Another thing is their choice of the type of equipment to use -- maybe a speaker system that translates, meaning a mix that sounds good on it will sound good on a lot of different kinds of systems. That's often a very different sounding system than a system that most people enjoy listening to. Of course, not everything that reached people's ears did, or does, make it to the recording medium. Recording is kind of an interpretive act. Engineers choose to use mics with rolled off HF, and mid range humps, they make choices about mic placement that result in very different sound on tape or disk than what someone might hear with their ears positioned mid hall. Tullman, gorangers, John Schofield and 6 others like this. Thanks for the reply. No this is strictly in the per view of the studio electrician. Bandwidth and dynamic range were not any more limited in 1958 than it is now. Even though reproducers were not up to it at the time, the cutterheads of the time (Westerex 3D) had bandwidth to well past 40KHz. It took about 10-15 years for home reproducers to catch up. In the studio we don't use junky microphones. We like to use nice stuff. Microphones have been so good for so long that if a jaundiced audiophile hears a direct microphone feed, even on fairly cheap headsets he can be easily fooled. But commit that feed to a recording media and some of the life is lost. That's when its a lot easier to tell live from recording. But a good recording can still be quite convincing! Most consumers don't have systems capable of extracting everything on the recording. Analog or digital has nothing to do with it. When you hear a high end system for the first time and especially if you live with one that is properly set up, you then come to the realization that the recording industry has had their act together for a very long time. The limitation has always been on the playback side. As an example, to this day, any LP stereo mastering system can cut undistorted grooves that no tonearm/cartridge combination can hope to track. Playback is still the limitation in that regard. So its likely that we will be continuing to discover that our recording collections have more to give than we are currently aware of. SandAndGlass, sbayle, gakerty and 3 others like this. Computer generated music - electronica!!! Ralph are you a RE or a studio electrician? 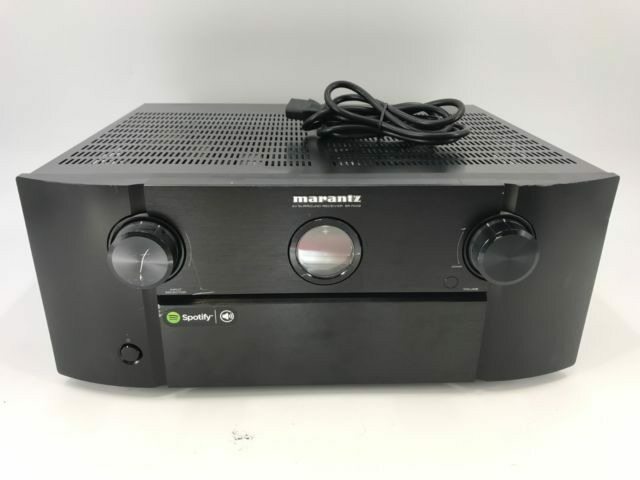 FYI - The look which you do not like above was meant to be retro and was designed to mimic the look of the legendary Marantz Model 9 Amplifiers. I run a small recording studio with an LP mastering operation. I also manufacture high end audio equipment. It's really not the purview of an electrician -- the electrician would just run in-wall AC or pull the ethernet cable or something, maybe measure for leakage current and ground noise at the AC receptacles, etc. Some of it's work for an acoustician, other of it is basic audio engineering and equipment engineering work (you know, electronic signal IS the medium of the audio engineer), but not really the kind of stuff you'd hire an electrician to do. Electricians wouldn't be mucking with mics, or acoustics, or preamps, or doing equipment circuit mods or anything. It's acoustics and audio engineering and circuit design. I agree with Chervokas that the electricity or the way the equipment is powered involves only basic AC power input from the electrician who has to follow local code anyway. In terms of what happens after the outlet is installed (presumably well grounded), that would be up to the vagaries of the studio and the customers if they bring in equipment. I was in a studio some years ago where when the console was shut off to use a direct chain, an AC wiring fault was uncovered producing hum. It was suppressed when the console was powered for some reason. So all kinds of issues can occur in the real world. As I noted above, you can use double conversion AC regenerators to further isolate the components from the utility AC and to some extent from each other. Studios also have UPS devices. And balanced power. Look at the client list for a company like Equi=Tech. Lots of studios and production facilities. When I spec'd out an isolation transformer for my room (not a pro studio, simply a listening room) from Controlled Power in Michigan, they did have a consultant on the West Coast who addressed power needs for recording studios. Beyond that, I relied on a commercial electrical contractor who did all kinds of stuff- ball fields, venues, work for industrial power set ups. The electrical contractor was responsible for opening the permit, getting the power wiring done, and getting the work approved by an inspector. Did not have a clue about sound, acoustics, component wiring or the like, though the lead guy totally understood grounding, voltage drop and shielding issues relating to the AC power part. I doubt most people who design acoustic spaces or actually build out a studio or its electronics are themselves licensed electricians, though they may be electrical engineers. One of my clients had a custom board built by George Massenburg, who also did work at Skywalker. I think he's an EE,* but I doubt he's got a license to wire an AC receptacle. *Just checked, Massenburg dropped out of engineering school as a sophomore. Oh, well, probably didn't help his career. A pair for sale local on craigslist, only $8,700... yikes! Who is responsible for setting up the gear racks and any bonding of gear or grounding that may be done for the rack (single point). OP, I think you are searching in the wrong direction with your emphasis on electrical engineering. The key to understanding why there is more information stored in recordings than a given hifi setup can reproduce, is simply that it is easier to design a well-functioning microphone than it is to implement a perfect reproduction setup in a given room. It's all about physics.